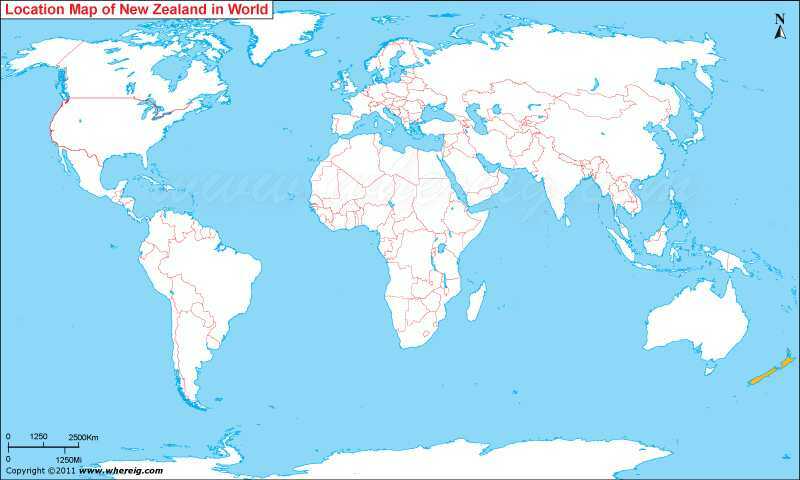 Where is New Zealand located on the world map? The given New Zealand location map shows that New Zealand is located in the south-western Pacific Ocean. New Zealand map also shows that it is constituted of group of islands significant of them are North Island and South Island separated by the Cook Strait. The smaller islands are Stewart Island, Chatham Island etc. Geographically, New Zealand is isolated country in the South Pacific Ocean. Australia is located about 2,000 km North-west of New Zealand. The climate type of New Zealand is temperate featured with mild weather system. New Zealand was formerly British overseas territory and it became self governing region in the year 1852 and thereupon it became a Commonwealth realm in 1947. Surprisingly, New Zealand was the first liberal country in the world which had been given the voting right to women a way back in the year 1890s. Though, the government type of New Zealand is a constitutional monarchy characterized with parliamentary democracy. But the head of state is Queen Elizabeth II and the Queen is represented by the Governor-General. However, the governor is appointed on the advice of the Prime Minister of New Zealand. The economy of the country is largely dependent on trade, predominantly agricultural products. In addition, the tourism is another sector. New Zealand tourism is gradually growing.